Subseries consists of photographs collected and maintained by the City Engineering Department as a record of the 1950 flood. 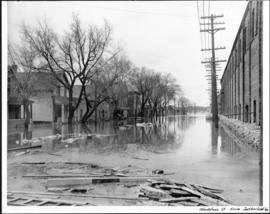 Photographs primarily document flooded areas in Winnipeg, showing street views, buildings, bridges, and other details related to the built environment. All photographs were taken by Harold K. White Studio. Photos removed from binder #6, "1950 Flood Photos," one of a set of 6 scrapbooks formerly located in Area I, Row 9, Shelf 345. A list of photographs is available. Description prepared by SJR, 2017.